The characters ઙ, and ઞ (except in the જ્ઞ conjunct) are virtually never used, and in words in which they might be used, an anusvār is employed instead. These characters do however frequently occur in Gujarati transcriptions from Avestan and Sanskrit. There is no phonemic distinction between i / ī and u / ū. In pre-MSG orthography, the /i/ vowel is always spelled ઈ (as in પારસી વીષયો pārsī viṣayo, not પારસી વિષયો) and the /u/ vowel is spelled ઉ (મારું ખુન mārũ khūn, not મારું ખૂન). In pre-MSG orthography, the anusvār is written before all nasal consonants, as well for all nasalized vowels (મરંણ for મરણ, કેતાબખાંનામાં for કેતાબખાનામાં). The consonant હ in contexts of murmured vowels is employed somewhat randomly. Thus પોંચવું for MSG પહોચવું, વાલું for વહાલું. Sometimes it is written in conjunct with the preceding character, thus ન્હાળું for MSG નાનું. સ / શ are fully interchangeable in pre-MSG orthography. ર / ડ are often confused, especially in cases of the /ṛ/ phoneme (Hindi ड़). Thus ઠેડવવું for MSG ઠેરવવું, પોંચારે છે for MSG પહોંચાડે છે. શ્રી મુંમબઈ દુરબીનનાં પતરોમો કેટલાંએક પતરો એક કલંમ કશને નાંમે છપાએઆં હતાં જેહમો મીશીનેરીઓ જેવો પારસીનાં ધરંમની ખોટી બદગોઈ કરતા હતા તેવોને અતી ઘણાં પરશંનો પુછેઆ હતા તથા પારશીનાં ધરંમની પવીતરાઈ દેખાડી આપી હતી તે પતરો તથા બીજી થોડીએક બાબદો વધારીને તેહની આએ કેતાબ બંનાવી છે. 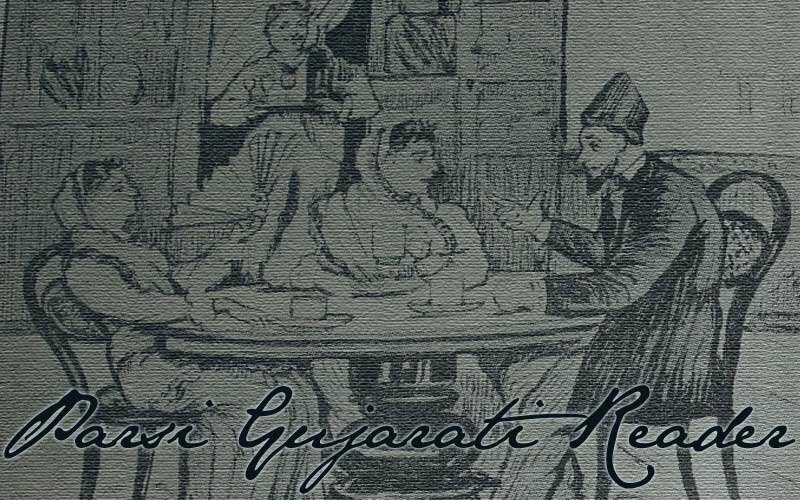 "Some letters published in the Mumbai Durbin by someone named Kalamkaś, in which the missionaries, who had been falsely insulting the Parsi religion, were asked a good many questions, and the purity of the Parsi religion was demonstrated – this book consists of those letters and some other subjects in addition." In Perso-Arabic words, the following equivalences are used: ક for ق, ખ for خ, ગ/ઘ for غ, જ/ઝ for ظ ض ذ ز, ફ for ف, આ/∅ for ع. Examples: قلم becomes કલમ, خانه becomes ખાનું, وغیره becomes વગેરે, زرتشت becomes જરતોશત, فارسی becomes ફારસી, جعفر becomes જાફર. Note that Perso-Arabic short /i/ is usually represented by Gujarati એ and short /u/ by Gujarati ઓ, as are the diphthongs /ay/ and /aw/, respectively. In this respect, Gujarati is different from Modern Hindi, and looks suspiciously like Modern Persian pronunciation, though the reason for this more likely pertains to the history of the Gujarati stress accent. Thus: કેતાબ for کتاب (Hindi किताब). The એ vowel also represents the Persian izāfa construction. Note the important (and very common) exception: ઈઆને for یعنی. All content published on this page is copyrighted by Daniel J. Sheffield © 2011-2014 and distributed under the Creative Commons Attribution Non-Commercial No Derivatives License 3.0. If you have any questions or suggestions, please contact me at dansheffield@gmail.com.